From Andy Warhol to Keith Haring, artists have been designing wristwatches with scant regard to horological memes. In every case, the watch has merely been a canvas, as with Warhol’s Manhattan photographs or Haring’s graffiti. 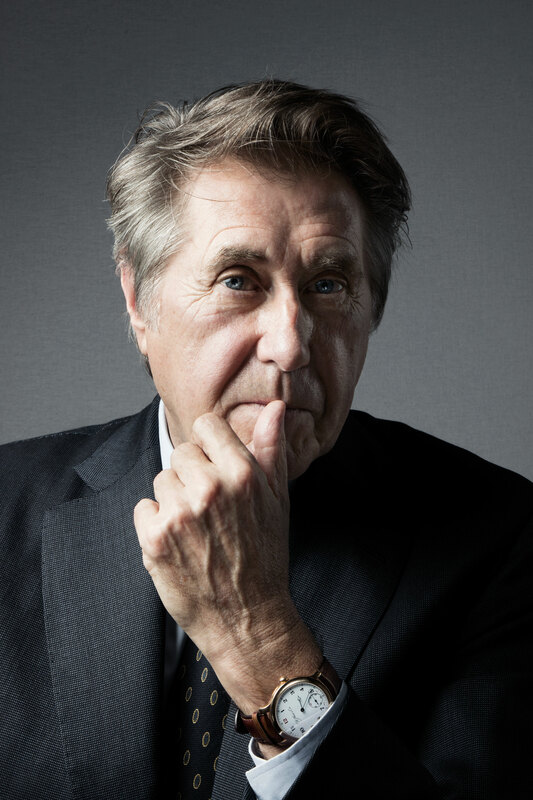 For Bryan Ferry, art college-trained in painting and sculpture but known best as a musician, his collaboration with H. Moser & Cie was far more fundamental. What Ferry created – with no experience in the design of watches nor an obsessive interest in watch history, but using his own sense of aesthetic correctness – was a perfect dial for a pocket watch circa 1905, adorned with his own choice of hands, colour details and font, as well as the strap. 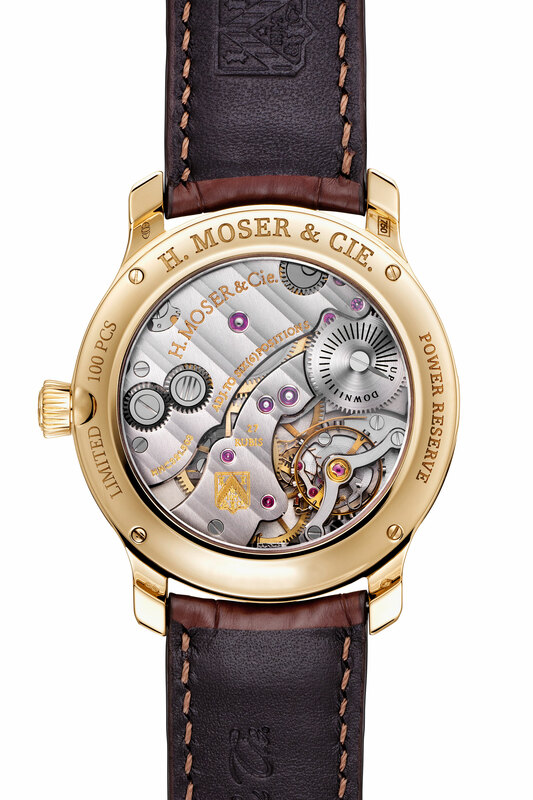 Its debut at SIHH was a triumph, and Revolution was privileged to meet with Ferry and Edouard Meylan, CEO of H. Moser & Cie, at the Salon. For Ferry, who had designed his and Roxy Music’s album covers, it was a new experience. As for working on albums covers, Ferry says, “I find that fascinating. It’s one of the only opportunities I have to express myself visually.” This would be a complete departure from an LP sleeve or CD booklet. “I like watches, but I’m not a watch collector,” he says. “Although, over this long life, I’ve acquired a few. The first stipulation was the size. I wanted something smaller.” His preferred look was “something from the past, but not a particular period. I took from here and there.” The idea was, “to have a sort of ‘vintage-ish’ theme to it. So we looked at the Moser history and the things they had done in the past. Ferry and H. Moser can be proud of the watch that bears the singer’s name. It is so deserving of the adjective “classic” that it seems brazen to adjudge it so, given the newness. But standing the test of time will not be a problem: Ferry attended to every detail with the eye of both a watch connoisseur and a man of supreme taste in general. 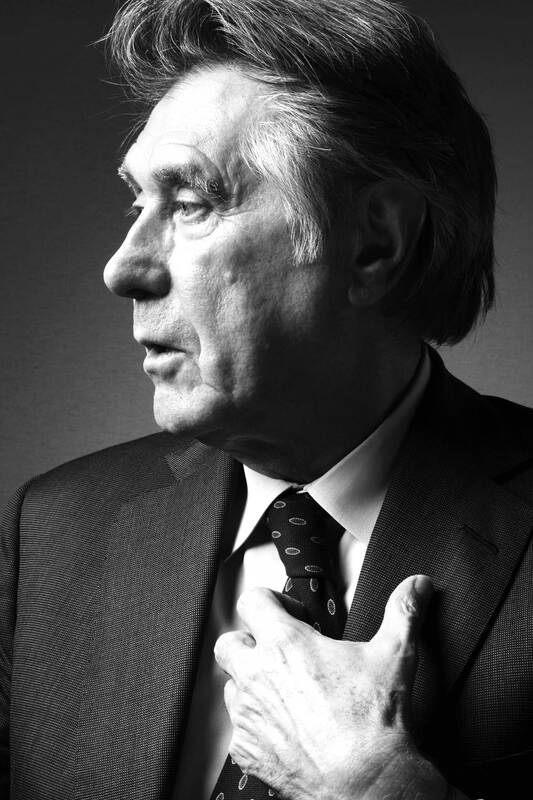 It is as handsome as one of his tailored suits. Choosing the Endeavour Small Seconds afforded Ferry a constraint that ensured a “period” look, thanks to its layout. Small seconds all but disappeared with the advent of the easier to-read sweep seconds hand, but never quite died away because a subdial provides an alternative aesthetic to three hands from the centre. Even without the effect of a small seconds dial, the watch oozes “vintage”, but not in the manner of “obsolete” nor even “retro”: “timeless” best defines it, in the manner of a fine pair of brogues or horn-rimmed specs. 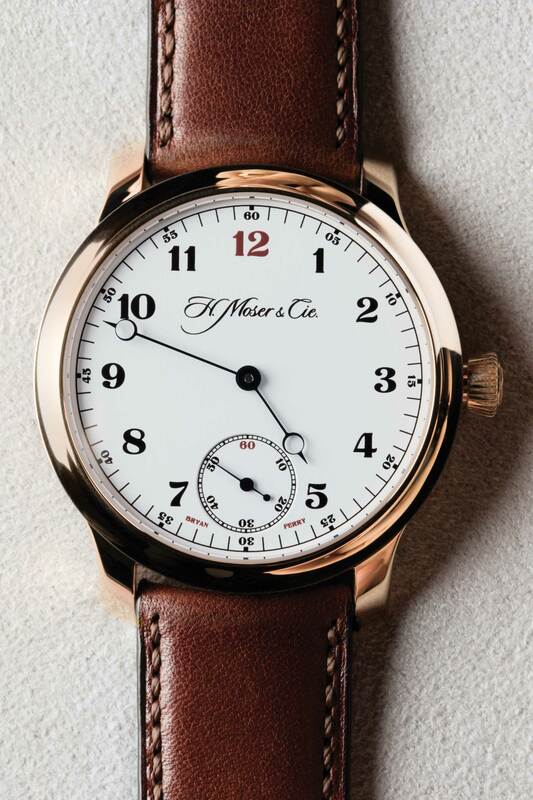 This is further ensured by the watchmaking reference to historic models from the H. Moser & Cie archive, including dial details from specific pocket watches in the company’s past. After producing a number of prototypes, Ferry and Moser settled on a design that is almost impossible to fault. 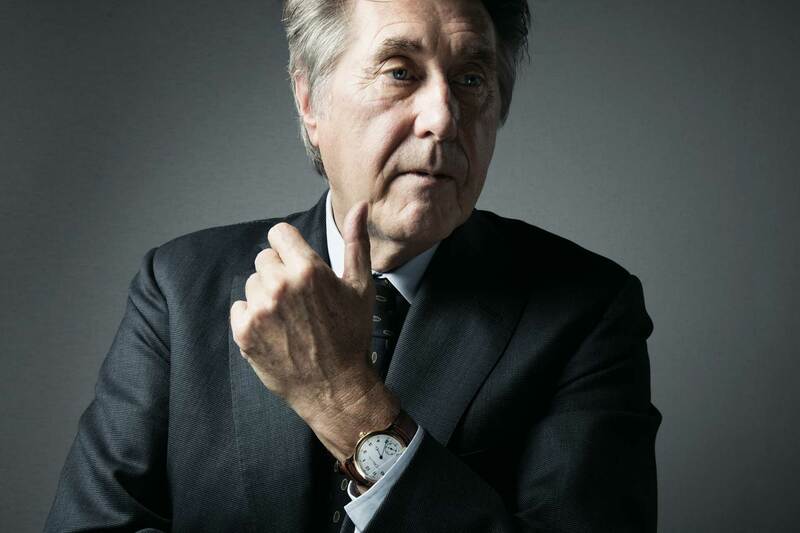 For the Bryan Ferry Limited Edition, the dial is lacquered in white with a matte finish, and for the Arabic numerals, Ferry chose a clear font that denies modernism. The numbers could have adorned any pocket watch or clock made between the 1850s and 1920s. Ferry did draw the line at too much antiquity: Roman numerals would have been a bit too much “silent movie piano player spats”. Ferry also opted for a simple chapter ring for the minutes, eschewing railway track indication. For both the large dial and the small seconds dial, he added a touch of colour, with a red 12 for the hours and a red 60 for the small seconds against the black used for all other numerals. Pointing to the hours and minutes are ultra-slim, achingly elegant Breguet-style hands in blued steel, with small seconds marked by a traditional hand with counterbalance, also in blued steel. Other decoration is restricted to a crown adorned with an “M” and engraving on the case back that reads “LIMITED 100 PCS”. A view through the case-back’s sapphire crystal reveals the beautifully finished, hand-wound, in-house, 27-jewel HMC 321 calibre of 32mm (or 14¼ lignes) diameter and a height of 4.8mm. It runs at a sedate 18,000vph and delivers a weekend-conquering power reserve of three-day minimum; the power-reserve indicator resides on the movement side, reading a delightful period worthy “Up” and “Down”. Another nice touch is hacking seconds for precise time-setting, while the movement features Moser teeth for all wheels and pinions, an Original Straumann hairspring with a stabilised Breguet overcoil and the interchangeable Moser escapement for easy serving. 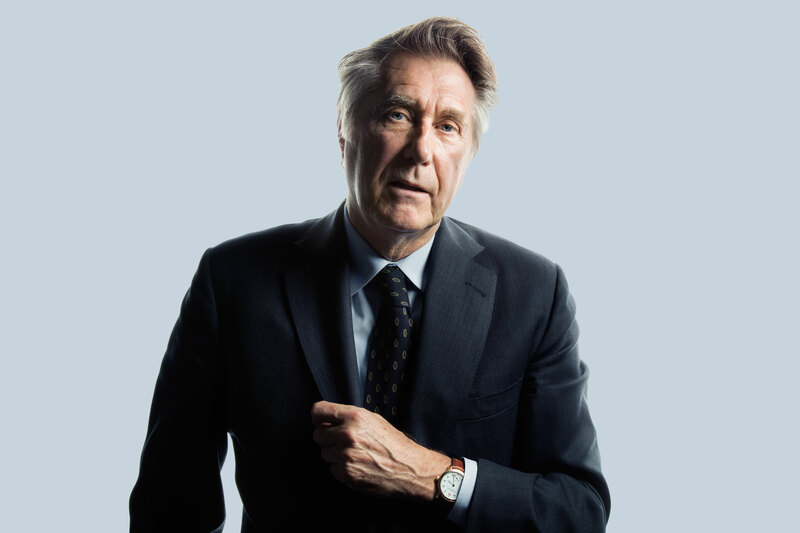 Thus, despite its seeming simplicity, the Endeavour Small Seconds Bryan Ferry is peppered with many small yet fascinating details.